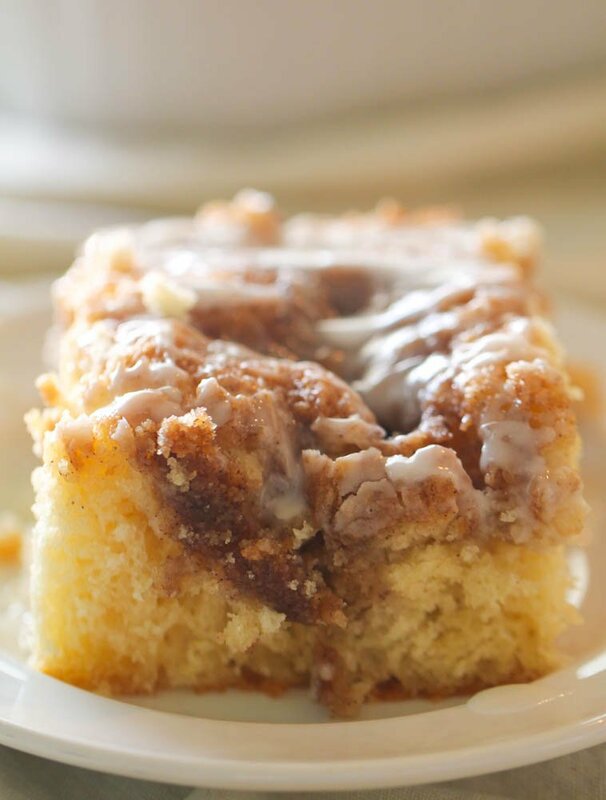 This Cinnamon Roll Cake has all the delicious flavor of homemade cinnamon rolls, but without all the work! Simple cake made from scratch, swirled with cinnamon, butter and brown sugar with a sweet glaze drizzled on top makes this cake an absolute favorite. Every Halloween I make homemade cinnamon rolls and hot chocolate for all the trick-or-treaters in our neighborhood. It’s quite the undertaking! I absolutely love homemade cinnamon rolls, but I don’t love the time and mess it takes to make them. The other great thing about this recipe is you don’t have to fuss with yeast, which so many people hate dealing with when it comes to making cinnamon rolls. That’s where this Cinnamon Roll Cake comes in. All the delicious flavor of homemade cinnamon rolls in one easy-to-make cake (with ingredients you probably already have!). Don’t let the words “cinnamon roll” scare you away! This cake is so simple and has just a few ingredients. Step 1: Preheat oven to 350 degrees F.
Step 2: With a hand or stand mixer, combine flour, salt, sugar, baking powder, milk, eggs and vanilla. Once combined, mix in melted butter. Step 3: Pour batter into a 9×13-inch baking pan sprayed with nonstick cooking spray. Step 4: In a large bowl, mix together softened butter, brown sugar, flour and cinnamon until combined. Step 5: Drop by spoonfuls over the batter and use a knife to swirl cinnamon topping into the cake for a marbling effect. Step 6: Bake for 25-30 minutes, or until an inserted toothpick comes out clean. Step 7: Whisk together all glaze ingredients until smooth and drizzle over warm cake. Step 8: Cut into slices and serve. My kids thought this was the best cake ever. I love how the top gets a little bit of a crispy, sweet topping. I love how light and fluffy this cake is! 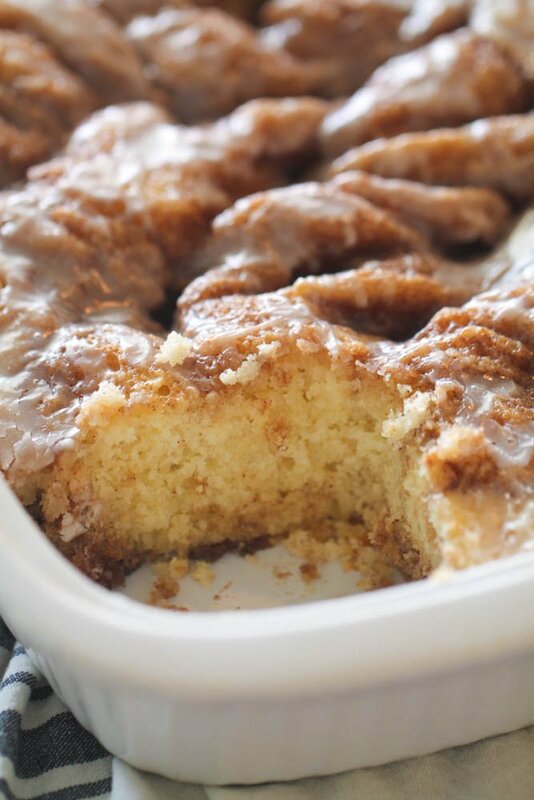 My husband said this Cinnamon Roll Cake “melts in your mouth” and I have to agree! 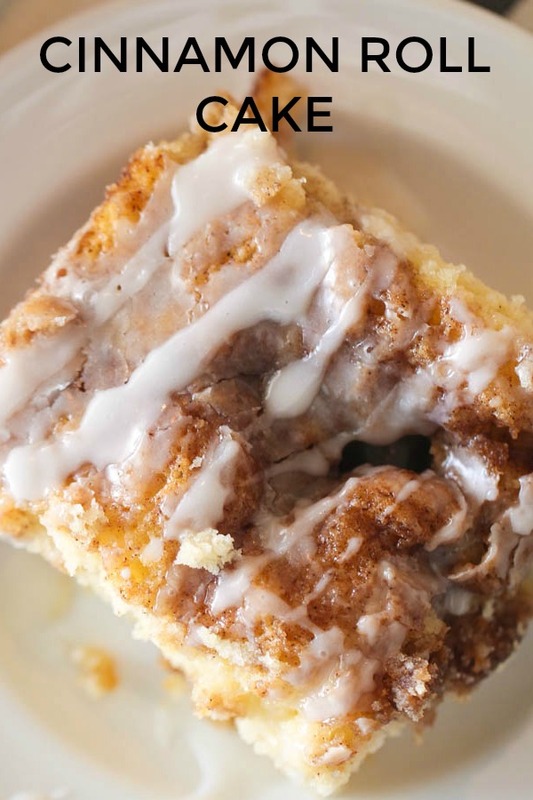 A fluffy homemade cake with cinnamon filling and a sweet glaze drizzled on top. All the flavor of cinnamon rolls in an easy-to-make cake! With a hand or stand mixer, combine flour, salt, sugar, baking powder, milk, eggs and vanilla. Once combined, mix in melted butter. Pour batter into a 9 x 13 inch baking pan sprayed with nonstick cooking spray. In a large bowl, mix together softened butter, brown sugar, flour and cinnamon until combined. Drop by spoonfuls over the batter and use a knife to swirl cinnamon topping into the cake for a marbling effect. Bake for 25-30 minutes, or until an inserted toothpick comes out clean. Whisk together all glaze ingredients until smooth and drizzle over warm cake. 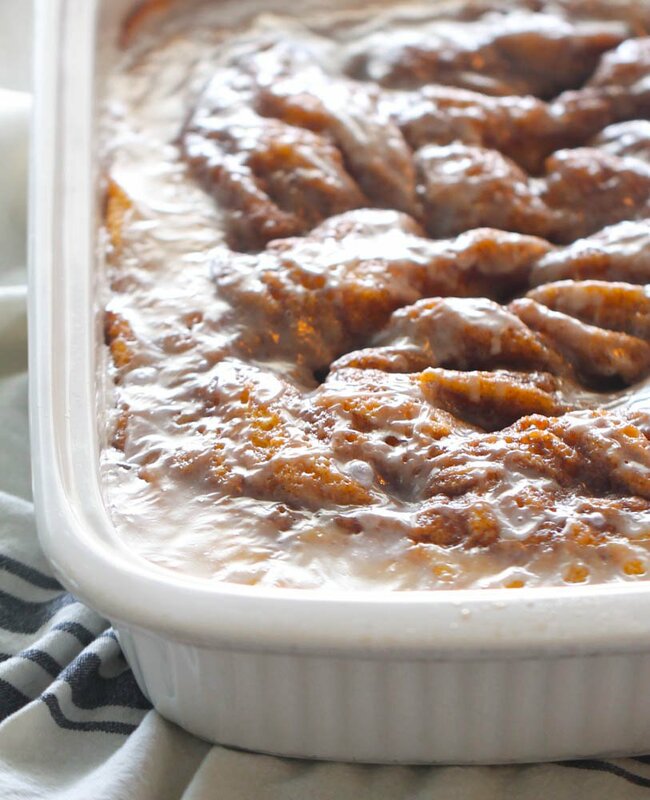 If you love this Cinnamon Roll Cake, try our Caramel Pumpkin Poke Cake! This is one I will have to try. I find such awesome recipes here! Thank you! My sister would love this! I just pinned it for her. It would be perfect for her birthday! I made it and the cake is way too dry! Need more butter? you need to sift your flour otherwise you put too much and the cake becomes dry and heavy. Is that 1/4 tsp salt? I'm sure it probably is...but it's left off the recipe. Yes! Just a 1/4 tsp! Thanks for catching that! This sounds great and I really want to try it. I have a question though... It says "1/4 salt". I'm assuming that's a teaspoon? Thanks for the great recipe! In the directions you wrote :sugar, salt, sugar, but in the ingredients only one sugar amount is mentioned. Just checking to make sure there isn't supposed to be a white & brown sugar..? Thank you for catching that! That is what I get for typing this post late at night! There is only supposed to be sugar once . . . I changed it now so that it makes sense! Is it light or dark brown sugar that you are using? I am planning on making this today ! There is snow on the ground here in Oregon and Brrr...it is cold ! This looks and sounds scrumptious! Looking forward to trying it. Wow! That looks amazing and I'm sure it tastes amazing too. Thanks for sharing the recipes. Ok you got me! Every project at the TT&J party that I click on send me back here! I will have to follow and will be pinning these bits of heaven for sure! I'm pinning this to make later! I made this yesterday. It was excellent. I actually used just a yellow cake mix and it was fabulous. Gooey mess and I had to bake it for 45 minutes. It still wasn't done. All the brown sugar, cinnamon and butter ended up in the bottom. Way too much butter!!! Yum! I wish I had the time to bake all your recipes but especially this one! 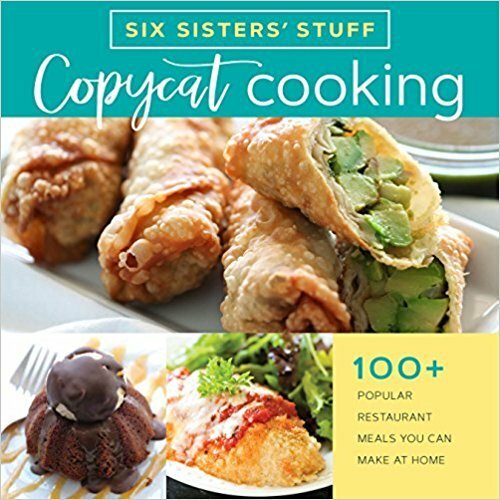 I'm interested to know what cookbook your sister gave you. did u use plain flour or selfrising flour? This looks absolutely amazing!! I'm a new follower and just signed up for email updates!! Made this for a potluck and it was a hit! It's so moist and not too sweet. Thanks for a fantastic recipe! I just made this with half the butter mixture. I spread half of what I had on top and reserved the other half for after it's baked in case it's not sweet enough. I can't wait for it to come out of the oven. for people who are complaining about a gooey mess - I put the butter mixture on top and DID NOT swirl it. While it mostly sank down, it was fine (and I managed to forget the flour, which would have helped it stay afloat). I also tripled the cinnamon and used a cream cheese frosting. This is now going to replace my regular Christmas morning breakfast (Grands Cinnamon Rolls with Cinnabon cinnamon filling) because it is DELICIOUS and EASY! This looks amazing.... wondering if I could make it at night...refrigerate and then take out to get to room temp and bake in morning... any thoughts? Seriously delicious! Someone at work made this and I almost died after sampling. Dangerous but delicious! I made these for work yesterday and they were a hit! I put them in muffin cups though, and I made a cinnamon buttercream frosting and transformed them into cupcakes! I really want to make this, but am unsure what "T" stands for. Is it tablespoon? Sorry, it's probably really obvious, but I've never come across it before. Not a problem! The big "T" is for tablespoon and the little "t" is for teaspoon (although I just put tsp for teaspoon in this recipe). :) Hope you love it as much as we do! Just got done making this, and it is delish!! I do think that there is too much butter, when I make again, I will use less butter. Great recipe!! What type of flour should I use? Self rising or all purpose? Can we use a pre-cake mix? (like in the box)? Please answer asap! Thanks! I love this cake, so so good. Made one to try it out before a big family dinner, it was great. So I had to make 2 for the big family dinner, needless to say, there was not a crumb left. Thanks! Made this and it was a huge hit. So good, not a crumb left. Followed the recipe to a T and it was perfect. Not sure what the others did that said it was too gooey. Will make this again & again! Made this tonight for my family - I've never seen such huge smiles on my hubby's and son's faces! Big gooey mess=yummy! Super easy, and perfect for Sunday evening! (Or monday breakfast.... if it lasts that long!) Thanks so much for sharing your amazing talents! It's appreciated! I made this with pure butter, Madagascar vanilla, Saigon Cinnamon and King Arthur Flour! It was a hit!! Will definitely be making again and again! This recipe is awesome!!! I have made this twice now and my family has decided they like it cooled, not right out of the oven, but it is great both ways, this recipe is definately a keeper, thankyou!! Found this on Pinterest. Ummm...Yum! It did take longer than 30 minutes in my oven to firm up enough, but once it was done it was sooo gooood! I'm so glad I found this recipe on Pinterest and I've now joined your blog ladies.. my husband took me out shopping for shoes yesterday and in our haste to get home he forgot to get some cinnabon to take home as his treat for spoiling me yet again. I'm about to make this recipe for him now as a thank you for all the shoes he bought for me.. thanks for sharing this recipe and love your blog by the way!!! I made the cake and it was so good, my husband loved it. We had it as part of our brunch spread the following day.... Thanks for sharing the recipe and keep 'em coming. OMG, How could you do this to me? lol, I eat clean and this is just plain old TORTURE!!!! Cinabons are my weakness...I'm going to have to try this...I will not be able to stay away! Just made this today for my husband's birthday (he is the ULTIMATE cinnamon roll fanatic.) I added more cinnamon - though next time I may add some to the batter itself, too - and left out one of the 2 sticks of butter based on some of the comments and it was FABULOUS! He loved this cake. Thanks so much, sisters, for sharing this :) You made the best 6x6 (since he refuses to admit to being 36) birthday cake ever. Hello. I want to make this recipe since I've seen it on pinterest the other day. Right now Ionly have salted butter. Do I still need to add regular salt to the recipe if there is salt in the butter?? How does that work?? I think that it's totally a preference thing! If you don't want a salty taste and only have salted butter, I would maybe cut the additional salt from the recipe? I usually only bake with unsalted butter, but I am not the biggest help!! I am so sorry about that! baking in my oven right now & my house smells YUMMY! I just made this and it was great. I did add more cinnamon as I prefer lots of it! I make cinnamon buns with the same ratio of ingredients, but with 3Tbsp of cinnamon. That's what I used for this and it was a hit with everyone! Wow!!!!!!! I love cinnamon rolls but don't like the heaviness. This will be perfect. I will be making if gluten free so wish me luck. This cake was great!!! I made it for desert for dinner with my mother-n-law and she loved it!!! Thanks so much for the recipe!!! OMG! That looks insanely delicious! I can't imagine what good flavor it has since it tastes like a Cinnabon. I made this following the recipe exactly. I did NOT half the butter and it came out perfectly!!! It tastes soooooo good! Made this and brought it to work. It was a huge hit. Couldn't stop eating it! It's in the oven now. Only substitutions I made were cake flour for the all purpose because I didn't have any and 1/4 cup egg beaters + 2 tbsp oil for the two eggs because (surprise!) I have no eggs. Otherwise everything is exactly the same. I'll let you know how it turns out. So ya 25 minutes in my oven is all it took. Turned out great! No gooey mess here. Stays together well and tastes fantastic. Perfect substitution for the cinnamon rolls I was craving. But now after one piece I feel like I need to spend the next couple hours on the treadmill lol. I'm glad I read the reviews first about the cooking time. It definitely took much long than the recipe stated. About 20 more minutes. I wasn't impressed with this cake. I added more cinnamon and I'm glad I did because I don't think it would have had enough flavor. The actual yellow cake part was pretty bland. In the recipe you said 1 T cinnamon and 2 T flour..does this T stand for tablespoon? Yes. The "T" stands for Tablespoon and "t" stands for teaspoon. I made this recipe for my Sunday School class this morning and it was a great hit. I followed the recipe exactly and it worked perfectly, although I did cook it about 10 minutes longer than the recipe called for. I made this recipe for my dad and daughter and it turned out a little gooey after 30 mins so i popped it back in the oven for 10 more minutes and it came out perfectly. It's absolutely mouth watering and even better with vanilla ice cream!! I want to make this for a party, is it okay for it to be served at room tempature? I made this tonight and it was a BIG hit! I did have to bake it 40 minutes for it to get done in the middle but it turned out fabulous. My husband and brother-in-law loved it! Will definitely bake this again. Thanks for the recipe! And I love your blog. I am 1 of 4 sisters and we get together once a month with our husbands and kids to have a meal together and play board games. I will have to try this recipe on them, i know they will love it! Thanks again. I made this for our family Sunday brunch yesterday and it was gone within minutes of putting it on the table! Thanks for a great recipe! You could go to google.com and type it in and it will break it down for you. Hi can I substitute the milk for either soy milk or rice milk? I work for a law school and we have "Coffee Tuesdays" during the school year. This cake was a huge hit, thank you for sharing. I have 3 sisters myself and it's nice seeing other sisters bond through a shared enjoyment of baking/cooking like I do with mine. Way too much butter, baked for over 50 min. Still didn't solidify. It was a gooey mess! Can I subsitute brown sugar to white sugar? And if I do will the cake come out wrong and will it taste different? It will definitely taste different if you use white sugar in place of the brown sugar. Brown sugar is moister too. We have never tried it this way. Not sure it would even turn out. Sorry. Wow...can't believe this has only 1 star! I make this at least once a month to send in to work with my husband and now my son has requested I do the same. I've also taken it to family breakfasts. Sooo easy and yummy. Melody, I agree. I made this and helped myself to a modest portion and thought it was delicious. I brought the rest to work and it was gone before I knew it. Everyone loved it, including myself! Thank you for sharing this recipe. Have a happy holiday! I have to say that I absolutely LOVE this cake, it is delicious and so easy to toss together at the last minute! But, that picture at the top is TOTALLY deceiving! lol You could make it look like that I suppose, but why would you want to when you can pour all of that lovely icing on top and let it ooze and melt and get in all those little nooks and crannies instead? If you haven't tried this recipe yet, then what are you waiting for? It's AMAZING! Just do it. Who cares about calories and carbs anyway, they don't count when things are this delicious! Always a hit, and uses basic ingredients I always have on hand. The only changes I make are halving the butter in the cinnamon topping from 2 sticks to 1, and using an extra tsp cinnamon and baking 10-15 mins longer. I just pour the icing over the warm cake and it makes it so moist and yummy! I wonder if the people who complain about this cake being a gooey mess realize that the cinnamon filling/topping part is meant to be the same consistency as the filling in a cinnamon roll..it is not firm like cake, the cinnamon part of this cake is a bit gooey but that makes it so delicious! Definitely recommend! I made this today and it is DELICIOUS!!!! In the instructions, flour is listed twice, batter and topping. In the ingredients, it list 3 cups of flour? Typo or split of the three cups of flour? It is listed twice in the ingredients. Sorry if it was confusing. We made the directions more descriptive. Where can i rate, not sure why this isn't 4-5 stars. We have made this exact recipe from this page at least 6x. It is awesome. People love it! My 10 year old daughter likes to make it herself too. Made this today as a last minute dessert and it is fantastic! Just like a cinnamon roll with a somewhat neutral tasting cake but a luscious cinnamon and butter filling and achingly sweet glaze. It's everything a cinnamon roll should be. This is going in the favorites... Family loved it. But, yes, it needed a few additional minutes in my oven. As with any recipe, timing is based on your particular oven's temperature. Thanks so much for this. Love your recipes! This sounds so good it making me want to try and make it so try it. I have made this cake twice and both times it was gone in 20 minutes. I served it warm. The first time the filling was very gooey and the filling sank to the bottom, the second time I melted the butter a little and it the mixture was much easier to marble through the cake. I have to make it again tomorrow night for my husband's work. I give this a 5 star rating! I made this for the first time last night for a dinner with our church. I overheard many people commenting on how good it was and wanting the recipe. I sheepishly said I made it and told them where to find your recipe. This will most likely become a new family favorite. Thank You. It was fabulous only thing I did differently was I extended cooking time by 8 minutes. My oven is always a bit slow. Everyone loved it, thank you! I made this a few months ago, and it was fabulous! I'm making it again for Easter brunch.......can't stop dreaming about it.... Yummo! Thanks for the great recipe! T means Tablespoon, t means teaspoon. Made this cake for breakfast this morning! So easy and absolutely delicious! Definitely will be making it again. 45 minutes in the oven and still not done. Smells good though. We haven't tried coconut oil in this so not sure how the taste would turn out. I just made this for the first time. I'm sure how it should look coming out of the oven but I have a little bit of the "gooey mess" in the corners. Any ideas on why this happens? And how to avoid for next time because it smells so good I know I will want to make it again. Thank you! Is there a way to make this in individual servings, like cup cakes? I was thinking of doing this for a bake sale. We have only made this as a cake, but looking over the comments one lady did make these in a muffin tin like cupcakes and they turned out beautifully! Watch them closely because the cooking time will be different. This recipe was a real disappointment. I was so excited to make it after seeing the picture and reading the ingredients. All the comments about it being a gooey mess are CORRECT. This is a terrible recipe for anyone who wants a yummy, moist cinnamon cake that actually bakes normally and doesn't have tablespoons of butter dripping everywhere! Been making this for 5-6 years now from this website. It never disappoints! Yay!! Thanks Amanda! We are so glad that you like it. It's a family favorite. Have a great week.